I have yet to crack the code as to why Americans love pineapple and ham (or Canadian bacon). Perhaps it is the desire for balance between sweet and salty or our obsession for seamanly kookie flavor combinations. No matter the reason, pineapple and ham are here to stay so here are some delicious recipes to fuel your obsession. Ham, cheese and pineapple egg rolls are an appetizer made straight from the pantry. This five ingredient dish combines diced ham, canned pineapple and string cheese in a wonton wrapper. You can easily turn this appetizer into a pizza roll with the addition of marinara sauce. Grilling season will be here before you know it so save this recipe for a day when you can cook outdoors. Your favorite barbecue chicken recipe is tucked in a soft bun and served with pineapple and ham. I recommend serving this meal with your favorite Hawaiian barbecue sides including potato salad and rice. Hawaiian ham and pineapple bowls is a wonderful way to use up any extra ham you have left in your fridge. 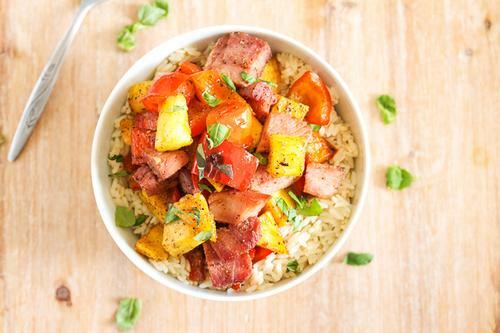 Chunks of salty ham and sauteed with juicy pineapple and red peppers before being served over a bed of fluffy white rice. We could not do a round up of dishes containing ham and pineapple without mentioning Hawaiian pizza. Although this combination cannot truly be considered a Hawaiian dish (the pizza was actually invented in Canada), the pizza remains a favorite on the mainland. In addition to the pineapple, Canadian bacon and cheese, this elevated version tops the pizza with crisp bacon and mushrooms. Hawaiian grilled cheese sandwich could not be any simpler. 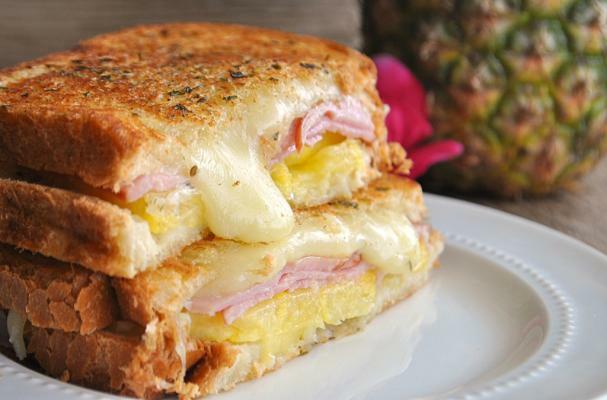 Pineapple rings are stacked with Canadian bacon and Monterey Jack cheese between two slices of bread. When I do not have fresh or canned pineapple on hand, I use pineapple preserves to create a "Monte-Cristoish" sandwich instead.